It is hard to be constructive about this bag design. The logo is great, but is in desperate need of a modern overhaul. A one color image with a newly fonted and designed branding would be a start. The photo in the middle is as unappealing as any we have seen on a Chips bag. The wording is old fashioned and even the flavor doesn't sound appealing; Sizzlin' Steaks, or something would be better. Nowhere on the bag does it say the Chips are Ridged! The Ridged design of these Chips provided a hearty, somewhat meaty crunch. It was not crisp or brittle. neither was it firm and hard. Very much a munch through reasonably thick and oily sliced potatoes. These Chips have a nicely spaced Marcelled Ridge. Most of the bag contents were medium sized and whole. There was a somewhat shiny-in-the-light oily sheen to the Chips, which the dark seasoning stuck to in uneven quantities. 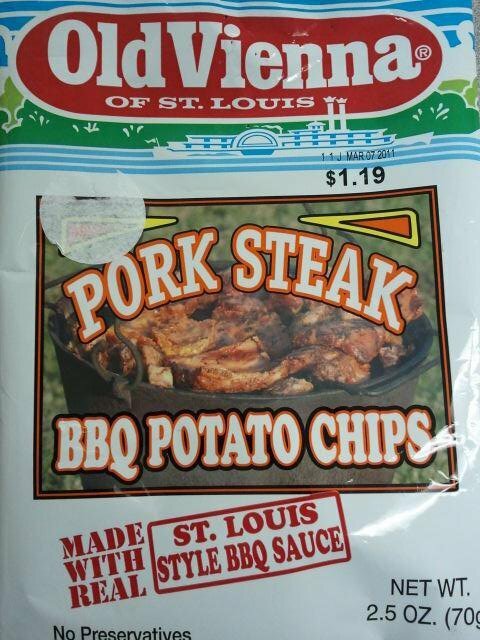 Pork Steak is a little unusual for a Chips flavor. The word 'Pork' is not used regularly. This was a fairly unique taste to us. There was no familiar hickory barbecue style flavor. Instead it was almost a burning salty tomato bacon. At Chips and Crisps we applaud new flavors, even if we don't like them. But we did enjoy these, despite their rather scary looking nutrition label.